The One Who Seeks, Find! Find the right match! Learn about Biblical characters! And have fun!! A brand new game with 51 cards, clear pictures and lots of information about Biblical characters! What did they do? When did they live? Where in the Bible do we find them? 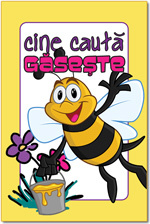 The children have to find the right match for each card, trying not to be stung by "The Bee", a beautiful coloured card. While having lots of fun, they will be learning about 25 main characters of the Old and New Testament. With the cards in this package the children can play four games, all of them described in the rules sheet included with the cards! Find the right match! Learn about Biblical characters! And have fun! A new game of 50 cards with beautiful drawings of characters from the Bible! Which characters from the Bible are linked? Just think: Adam and ... Eve, of course! Abraham and Sarah! But what about Caiaphas, Pilate, Daniel and Martha... can you find the right match? Form pairs and learn what the Bible says about these people! The life of a man who decided to stay with his people - a history lesson! An educational and interesting game. Children will join with Jeremiah and other lesser known characters from the Bible, learning new things about a difficult period in the history of Israel. The game is designed to develop the childrens knowledge, observation skills and attention to detail. They will hear a story told in simple language, answer age-related questions and solve problems. Pictures to colour and Bible verses to learn are included. And free download for some parts of the game! A simple game, but very educational and interesting. Children will live with Daniel as he served kings of Babylon. They will listen to the Bible story told in simple, understandable language, answer questions and solve problems appropriate to their age. This game will develop children's knowledge, powers of observation and attention to detail. Pictures to colour and Bible verses to learn are included. The adventure-filled journey of a disobedient man. A simple game, but very educational and interesting for children ages 5 to 10. Through the game children will follow Jonah's journey. They will listen to the Bible story told in simple, understandable language, answer questions and solve problems appropriate to their age. This game will develop children's knowledge, observation skills and attention to detail. Pictures to colour and Bible verses to learn are included. An educational game based on the the game of Taboo. Participants, in teams, take one of the games 135 cards and describe an action, object, idea or a concept in the Bible from the card. The player must not use any of the six words written under the name on the card. The game tests and develops knowledge about ideas, concepts, actions, objects that are found in the New and the Old Testament as well as the imagination and vocabulary of players. An educational game based on the game of Taboo. Participants, in teams, take one of the 135 cards in the game and describe an action, object, idea or concept in the Bible from the card. The player must not use any of the six words written under the name on the card. The game tests and develops knowledge of Old and New Testament characters, as well as the imagination and vocabulary of players. An educational game based on the game of Taboo. Participants, in teams, have to describe a city, mountain, river or lake, plant or animal in the Bible, using one of the games 135 cards. The player must not use any of the six words written under the word on the card. The game tests and develops knowledge about places, plants and animals that are found in the Old and New Testament as well as the imagination and vocabulary of players. A game that follows the footsteps of Paul from his conversion until he reaches Rome. An exciting game for children and parents, for young and old alike! Dozens of questions covering all the events surrounding the birth of Jesus, with the questions, answers and Bible references on beautiful printed cards. Without realising it, participants learn a lot about the events of Jesus birth as presented in the Bible. As correct answers are given pieces are acquired to complete a puzzle of a picture of the subject painted by a famous artist. In a second game participants give the correct answers to the questions as they travel with their pawn from the shepherds field to the manger in Bethlehem. Who said this? Who did this... in the New Testament? Who said this? Who did this... in the Old Testament? You can spend hours with groups of adolescents and youth, family and friends, entering into the fascinating world of the Bibles main characters, finding out what they thought, how they lived and what they did! The box contains several versions of this game that can be used anywhere: at home, Sunday school classes, youth meetings for teenagers (and those of adults!) in camps, indoor or outdoor. 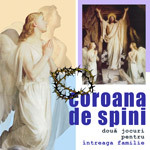 There is a CD included so that the questions may be displayed on a screen or monitor! CD with software for displaying questions on the monitor or a projector with a built-in software timer! 192 cards with Bible questions, their answers and Bible references take us step by step following Jesus from the Last Supper until after the Resurrection. For each correct answer players will earn a piece of a puzzle. When the puzzles are completed four superb paintings will reveal the most important moments of those days and help us understand the Price Paid by Jesus (so reads the first game). To Be with Jesus is the second game, As players answer questions correctly, pawns are moved on the board so that they get closer to Jesus at The Last Supper.